Okay this is totally the opposite of a wheelchair accessible truck, but it’s cool nevertheless. 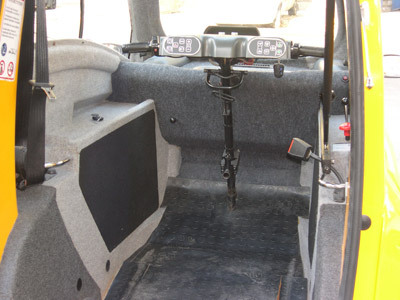 The Kenguru wheelchair car is a compact, single-rider vehicle that allows a wheelchair user the ability to roll in and drive! The company seems to be ramping up in recent months. Also, it seems that the vehicle may be making the rounds at the Abilities Expo. So it might be near you sometime this year. Hopefully I can get a chance to try it out soon. The Kenguru has a rear hatch that opens up, and a ramp that deploys (not show above) so you can easily roll right in. The steering is akin to a motorcycle. The vehicle technically runs like a scooter and can go 25 mph. It’s also battery powered so you can plug it in and have no gas expense. 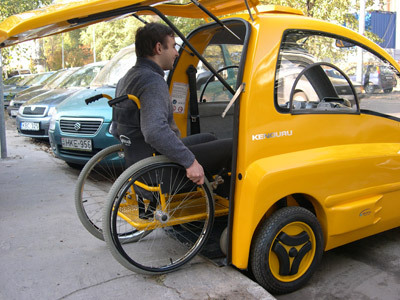 Check out the video below for some moving images of the Kenguru wheelchair car. You can also visit the Kenguru website for more information.